This Pesto Spaghetti Squash with Chicken is an easy and delicious dinner recipe that uses just 4 main ingredients. It is gluten free, low carb and can be made paleo. Ever since spaghetti squash were part of my first CSA box years ago they have been a favorite of mine. What’s not to love about a vegetable that allows you to enjoy your favorite pasta sauces but without the carb load of regular pasta. And I am not demonizing all pasta – we still regularly enjoy everything from whole wheat spaghetti, rice noodles and chickpea pasta in this house. But there is also something really nice about enjoying a spaghetti squash boat filled with your favorite sauce and protein. By now you may have gathered that I like pesto (I’ve posted homemade pesto recipes here and here). And that I like it combined with chicken and pasta (gf chickpea pasta and regular version). It was about time I made a version of it with spaghetti squash noodles. Depending on how much time I have and what size of spaghetti squash I have on hand determines how I cook it. When I need things to go faster or when I have a larger spaghetti squash I cook it in my pressure cooker. 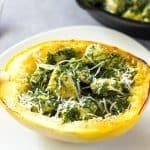 There are different ways to prepare Instant Pot spaghetti squash. Some like to leave it whole for pressure cooking, others cut the spaghetti squash in half lengthwise. I like to cut it along the width as this usually allows me to fit a larger squash into the pressure cooker. Be sure to remove all seeds (and ice cream scoop works well for that). Pour 1 cup of water into the inner pot and place a trivet inside. Arrange the squash halves on top of the trivet, then pressure cook for 8 minutes (10 minutes at high altitude). Quick release the pressure. Let the squash cool down until comfortable to handle, then scrape out the spaghetti strands. When I have more time I prefer to roast spaghetti squash in the oven. Roasting produces a slightly better flavor and texture I find. I love this method the best when I have smaller squashes, where 1 half makes one perfect serving. That is when I like to serve spaghetti squash as a half boat. For roasting I cut the squash in half lengthwise and remove all seeds. I brush the inside with a little olive oil and season with salt and pepper. Place the cut side down on a lined baking sheet and roast for about 25 minutes (longer for large squashes). Then loosen the strands a little and fill with the sauce. I don’t think I’ve yet encountered a pesto that I didn’t like. Although I usually make it at home, I also enjoy store-bought pesto from time to time. 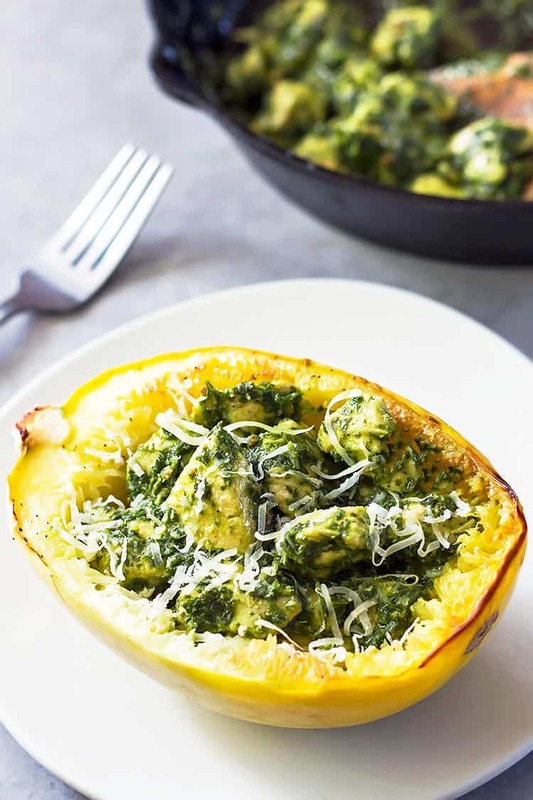 Any pesto will work for this spaghetti squash and pesto recipe. Choose one that suits your dietary restrictions. 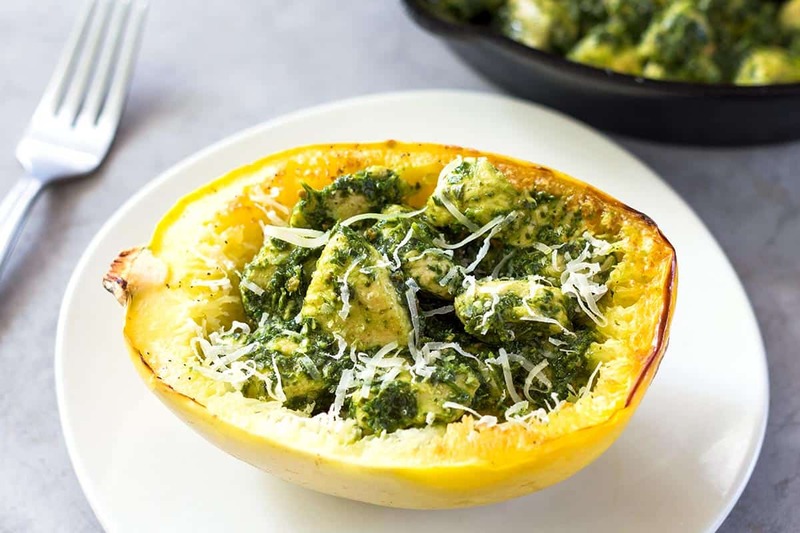 If you need this recipe to be dairy free or paleo, omit the parmesan cheese sprinkle on top and use the simple vegan pesto from this recipe. That’s the one I used here. One of these days I will make a separate post just that pesto, but for now you can find it within that other recipe post. When I am not roasting the spaghetti squash I like to pressure cook them in my Instant Pot. A small knife with a thin flexible blade like this boning knife works much better than a large knife to cut open spaghetti squash. 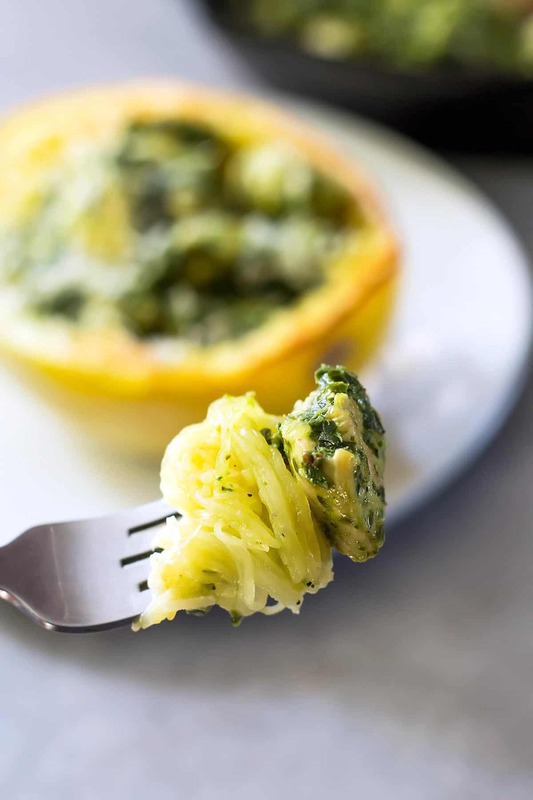 This Pesto Spaghetti Squash with Chicken is an easy and delicious dinner recipe that is gluten free, low carb and can be made paleo. If using small squashes, where 1/2 serves about one you can also serve it as a spaghetti squash bowl. Just loosen up the strands with a fork and add the sauce straight into the spaghetti squash half. Close the lid and turn the valve to sealing. Select the 'Manual' setting and adjust to 8-10 minutes. Let the squash cool until comfortable to handle. Use a fork to loosen and scrape out the spaghetti squash noodles, or serve straight in spaghetti squash bowl. Heat a skillet to medium-high heat then add a tablespoon of oil. When the oil is hot add the chicken pieces. Turn heat to medium. Cook the chicken until done, then season with salt & pepper. Deglaze the pan with broth/water and scrape up any bits stuck to the pan. Add the pesto and stir to incorporate it into the sauce. Serve the chicken pesto sauce into over cooked spaghetti sauce either in a squash half boat or on a plate.